Nicky Romero and his Protocol Recordings label returns with "Miami Reboot," aiming to depart from the WMC standards to "reboot" the system and create something revolutionary. 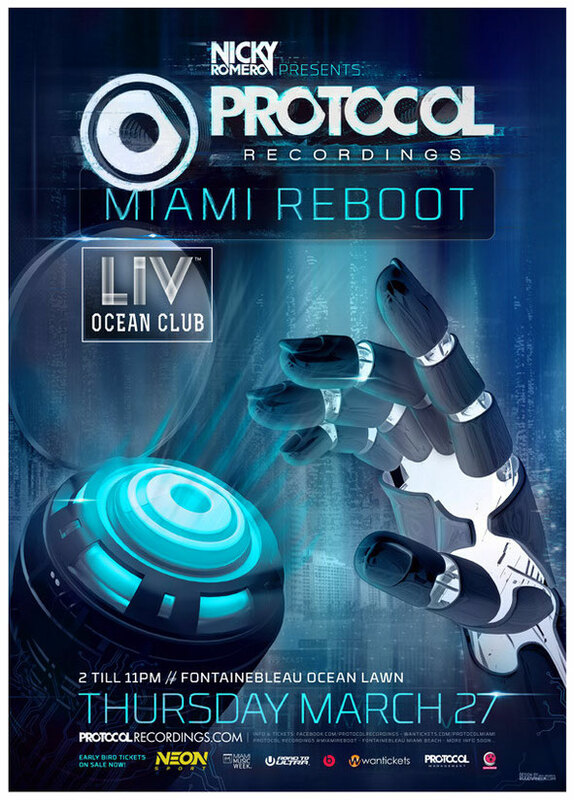 Taking place during the day from 2PM to 11PM at LIV Ocean Club at Fontainebleau Miami Beach, Protocol's Miami Reboot will host a lineup featuring Nicky Romero & friends. Protocol Recordings and its label nights have had a history of success with sold-out events across the globe. These nights saw Nicky Romero as a performer and an impresario with curation of artists such as Nervo, Don Diablo, Vicetone, Bassjackers, and John Dahlback, as well as special guests like David Guetta and Fedde Le Grand. On top of its label nights, Protocol Recordings continuous to release big room dance tracks, as seen by its most recent single, Tritonal & Paris Blohm's ‘Colors’, and the forthcoming ‘Moloko’ by Skidka & Hard Rock Sofa. This Protocol Recordings "Miami Reboot" aims to demonstrate Protocol's distinctive style and tastemaker appeal offering the finest in progressive house and electro.